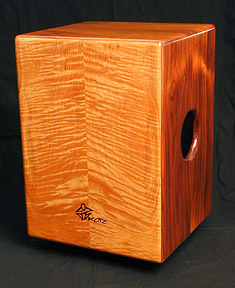 A modern tonal adaptation of traditional Cuban and Peruvian cajónes, the Kotz Tone Cajon™ provides hand drummers and percussionists with a unique new voice. A combination of luthier quality tone-woods, a unique "sympathetic resonating head" design, and meticulous craftsmanship all contribute to the instrument's deep, full sound. My goal is to make a very personal instrument that can serve as an extension of an artist's voice. Meeting with musicians to find out what sounds they're looking for is typically the first step to designing a cajón. It's important to ascertain their playing style and understand the context in which the instrument will be used. Will the player sit on the cajón or stand behind it? Will it be stationary or portable? For the studio or the road? Will it be amplified and if so how? The size and shape of the cajón, the type and thickness of wood used, and the sound hole size and placement all contribute to the instrument's pitch, character, volume, and timbre. Many Kotz cajón drums feature a sympathetic resonating head design which serves as a diaphragm much like the sound board of an acoustic guitar. The result is a remarkably clear and resonant tone. The tapa is made from a variety of different woods depending upon the desired sound. The low tones are warm and the rim or high sounds are bright without sacrificing character. Some of the woods I use are cherry, koa, mahogany, figured maple, ash, okoume, and bubinga. How best to utilize the natural beauty of a particular piece of wood plays an important role in the overall design. The instruments are made to be enjoyed esthetically as well as musically. I designed "Slap Pads" (Patent Pending) to add yet another sound to the cajón player's pallette. Generally made of wood, they're attached to the exterior of the instrument. Depending on their shape, size, and placement many new sounds are possible. From a back beat whack that really cuts thru to simulating the 'cascara' on timbale sides, the "Slap Pad" offers a unique sound found only on Kotz cajónes. If you're looking for a string or snare cajón I offer a wide range of options. This sound is generally associated with the Flamenco cajón. My versions feature a warm resonant bass along with a crisp "snare" sound in the upper register. For percussionists who prefer to stand I've designed large "doubles" mounted on sculptural legs. Essentially two drums in one, they can be played like a pair of congas. The tonal range of this instrument is remarkable. 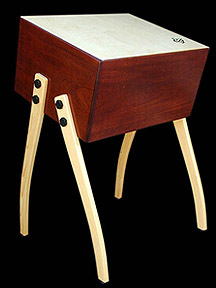 Custom stands are available for mounting a cajón to be played as part of a drum kit. Please email for further information and photos.